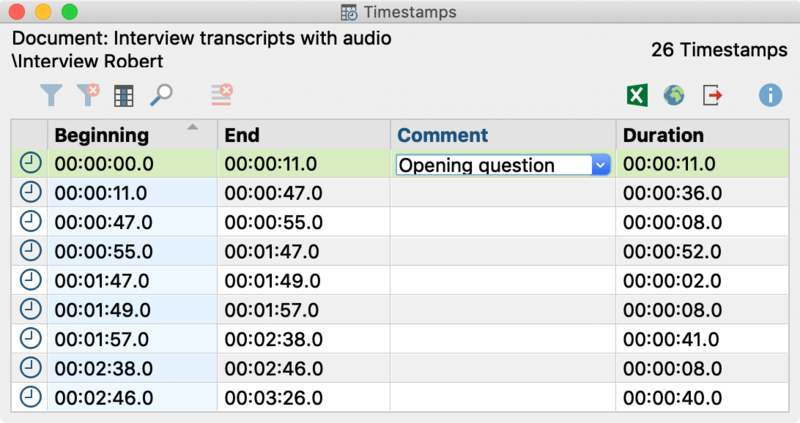 With timestamps you can link your transcript to the original recording so that you can always access the original sound and listen back to difficult to understand sections. By default, MAXQDA automatically enters a timestamp at each end of a transcribed paragraph, which is usually at the end of a speaker’s contribution. The timestamps appear in a separate column in the “Document Browser”. Clicking on a timestamp (or the range between two timestamps) opens the associated media file and starts playback at the stored position. Playback automatically ends at the next timestamp. Automatic timestamp addition can be adjusted in the “Transcription settings” window. If the window sis hidden, you can open it by clicking on the Transcription settings icon on the left side of the “Multimedia Browser”. Please note: You can hide the display of the timestamps in the transciption text documents by right clicking the text and de-selecting Display Timestamp Column. MAXQDA then inserts a timestamp where your cursor is in the text and visualizes it in the time stamp column at the left margin. You can also create multiple timestamps in a row, but only one timestamp is displayed in the timestamp column. Timestamps can’t be inserted at will, however, MAXQDA instead checks whether the chronology of timestamps is retained by inserting a time stamp. If, for example, the current playback position of an audio file is at 3 minutes, but a timestamp already exists at 4 minutes, no further time mark can be added. Please note: New timestamps can be inserted in the Edit mode as well as in the transcription mode. To delete an unnecessary timestamp, click on it with the mouse button and select Delete timestamp in the context menu. There is also a “Overview of Timestamps”, which lists all timestamps of the currently opened transcript. You can open the overview by clicking on the icon with the same name at the top of the “Document Browser”. In the overview, you can delete timestamps by marking one or more rows and clicking the delete icon.